U.S. News ranked The University of Scranton among the top 10 “Best Regional Universities in the North” and among the colleges on the “Great Schools, Great Prices” list published in its 2016 “Best Colleges” guide. 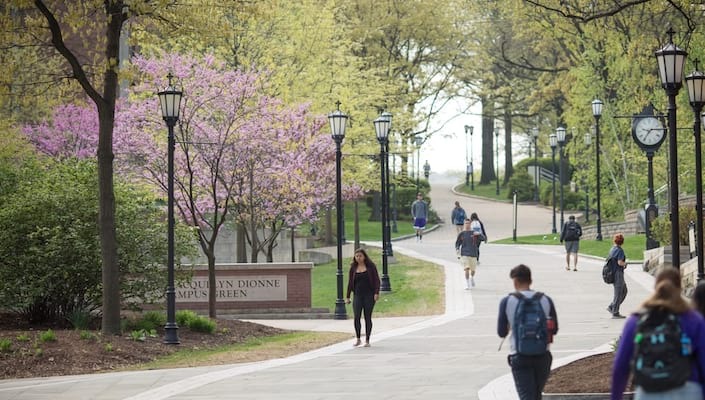 U.S. News & World Report has ranked The University of Scranton among the top 10 “Best Regional Universities in the North” for 22 consecutive years. Scranton is ranked No. 8 in the 2016 edition of the “Best Colleges” guidebook. Scranton is also among the colleges on the “Great Schools, Great Prices” list, which compares academic quality of programs to cost of attendance. The University ranked No. 15 among just 15 “Regional Universities in the North” chosen by U.S. News as schools that provide the best value. This is the third consecutive year Scranton was included in this U.S. News ranking. In addition, U.S. News ranked Scranton No. 7 for “2016 Best Colleges for Veterans,” a web exclusive listing of “top-ranked schools offer benefits” that can help “make pursuing a college education more affordable” for veterans. All colleges in this ranking are certified for the GI Bill and participate in the Yellow Ribbon Program or meet other criteria. “We continue to be pleased by the consistent recognition the University receives for the value of the education we provide to our students, as indicated by our inclusion in national rankings such as U.S. News and other guidebooks,” said University of Scranton President Kevin P. Quinn, S.J. U.S. News bases their ranking on a range of quality indicators that includes peer assessment of academic excellence (22.5 percent); graduation and freshman retention (22.5 percent); faculty resources (20 percent); student selectivity (12.5 percent); financial resources (10 percent); and alumni giving (5 percent); and graduation performance rates (7.5 percent), which compares a school’s actual graduation rates with predicted graduation rates based on characteristics of the incoming class. U.S. News categorizes colleges for their rankings based on the official Carnegie Foundation for the Advancement of Teaching classification of universities. The 2016 U.S. News & World Report’s “Best Colleges” rankings became available online Sept. 9. The University was also included recently in multiple national rankings such as Forbes and The Center for College Affordability and Productivity ranking of “America’s Top Colleges 2015,” The Princeton Review’s “The Best 380 Colleges,” and MONEY magazine ranking of the “Best Colleges for your Money,” among other listings.